Even as a young actor, Robert Redford often carried himself with the quiet dignity of an old-timer. In films like The Sting and Butch Cassidy and the Sundance Kid, Redford combined his boyish charm and good looks with a steady center that seemed borrowed from an older man; the combination of wise and wise-cracking enriched both sides of his personality, and helped make him a star. Many years later, and Redford, now 82, has grown up to be the old-timer he once channeled. 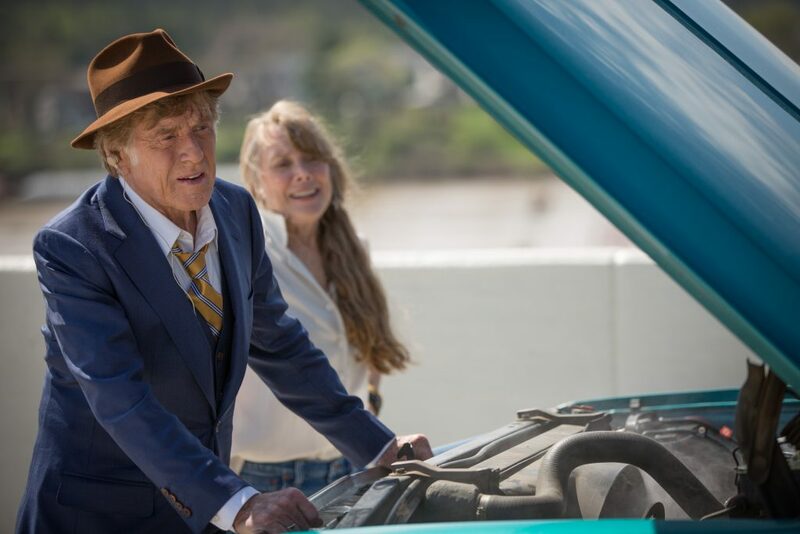 And for what may well be his last appearance onscreen — as the actor has suggested it will be — Redford has picked what looks like the perfect topper to his long career. The Old Man & The Gun, opening October 19th at Cinemark Theater in Hadley, is based on a true story (or “mostly true,” as the credits tell it, in a nod to Butch and Sundance’s credit sequence) about another man’s long career. Forrest Tucker (Redford) was a lifelong criminal whose string of exploits and escapes made him something of an American legend. Born in 1920, Tucker was escaping from prisons — and doing the crimes that landed him there in the first place — by the time he was a teenager. His on-again, off-again affair with the penitentiary system lasted right up to the millennium, when an elderly Tucker was incarcerated for the last time following his arrest for a string of bank robberies near the retirement community where he had settled down. But it was an earlier escape that truly made Tucker’s name. At the age of 70, Tucker and his confederates made a daring escape from California’s San Quentin prison, paddling away in an improvised kayak. They would stay free for the next four years, going on a crime spree that drew the attention and grudging admiration of John Hunt (Casey Affleck), a police detective in Austin, Texas. As Hunt tries to close the trap around the outlaws, the gang (Danny Glover and Tom Waits are along for the ride) enjoys their elder years — with Redford’s Tucker striking up a relationship with Jewel, a widowed horse rancher played by Sissy Spacek. What is literal truth and what is legend in a story like Tucker’s is an ever-shifting line, and even more so once you translate it to screen. (For details and a great read, track down David Grann’s New Yorker piece about Tucker, which inspired the film.) Director David Lowery (A Ghost Story) wisely skirts the issue, treating Tucker’s story more like a reflection of Redford’s own arc: the golden boy who always got out of a jam, and made it look easy. It’s a gentle reflection on a couple of American outlaws that both speaks to our cultural love for a good antihero and serves as a fond farewell to a man who was so good at playing them. Also at Cinemark this month is a 10th Anniversary event for a film that, for better or worse, changed a lot about what stories got told this past decade. Teen-vampire smash Twilight is that film, and director Catherine Hardwicke provides a special filmed introduction to the movie that launched a billion swoons. At the time, I panned it as “the Tiger Beat of vampire movies” in comparison to Let The Right One In, a Swedish film with similar themes that was unfortunately overshadowed by Twilight-mania. I stand by that assessment still, but if hunky, brooding vampires were your thing ten years ago, you probably won’t want to miss this. If you want your undead a little more weathered, be sure to check out the Night of the Living Dead 50th Anniversary event, coming to Cinemark on the 24th. George Romero’s landmark film (his sons will do the special introduction thing here) combined gore, horror, and piercing social commentary to create a true American original whose influence is still seen in the seemingly unstoppable onslaught of zombie fare in our culture today.